Yaaar! 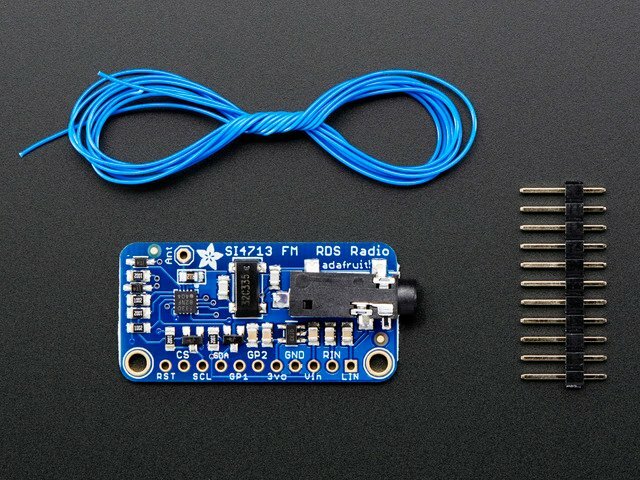 Become your very own pirate radio station with this FM radio transmitter. This breakout board, based on the best-of-class Si4713, is an all-in-one stereo audio FM transmitter that can also transmit RDS/RBDS data! Wire up to your favorite microcontroller (we suggest an Arduino) to the I2C data lines to set the transmit frequency and play line-level audio into the stereo headphone jack. Boom! Now you are the media. Listen using any FM receiver such as your car or pocket radio receiver - this is an easy way to transmit audio up to about 10 meters / 30 feet away. This transmitter even has RDS/RBDS support - that's text/data transmissions that many modern FM receivers support. (It's how some car radios can display the FM station and current song playing). You can transmit just about any text you want, set the station identifier as well as the 'freeform' buffer. Best of all, you'll be up and running in minutes with our awesome Arduino library, example code and tutorial! RIN - same as LIN but the RIGHT input. The FM transmitter chip requires a microcontroller for setting it up unlike pure-analog solutions that have a tuning potentiometer. The trade off is some code is needed, but the output is digitally tuned so its much more precise. Our codebase uses I2C to communicate. The chip supports SPI as well but it was annoying enough to support just I2C so we don't have code examples for SPI! RST - This is the Reset pin. You must have this pin toggle before starting to communicate with the chip. When at logic 0, the chip is in reset. SCL - this is the I2C clock pin, connect to SCL on your microcontroller. SDA - this is the I2C data pin, connect to SDA on your microcontroller. There's also two "GPIO" pins, you can use these to blink LEDs. The initial state of these pin sets up the chip for Analog Mode so don't short them to ground or VCC during reset. They are 3V output only! GPIO #3 is used for the 32Khz clock generator onboard. An antenna is required! We provide a 1meter long wire but you can also use a shorter or longer piece as desired. Place the Adafruit_Si4713 library folder your arduinosketchfolder/libraries/ folder. You may want to update the FM station transmission. By default the library transmits on 102.3MHz FM, but that might be 'taken' in your area. The larger the number the higher the transmission power. For example, 96.3MHz is a higher number than the others (FYI, its Univision 96.3 FM!) whereas 95.1 MHz is nice as low, that's not used for any transmission. Try to find a number that's also not surrounded by high numbers, since it can get 'drowned out' by the nearby frequencies. Whcih will set the currFreq currdBuV adnd currAntCap variables in the radio object. The first two are the frequency and power output, the third variable is the tuning antenna capacitor it set for the best output. This number will vary with antenna size and frequency. This function is used with two procedures. You can also send the main buffer which usually contains the song name/artist. It's easy to use the Si4713 FM transmitter with Python or CircuitPython, and the Adafruit CircuitPython SI4713 module. This module allows you to easily write Python code that controls the transmitter and sends RDS data. You can use this sensor with any CircuitPython microcontroller board or with a computer that has GPIO and Python thanks to Adafruit_Blinka, our CircuitPython-for-Python compatibility library. Next you'll need to install the Adafruit CircuitPython SI4713 library on your CircuitPython board. Before continuing make sure your board's lib folder or root filesystem has the adafruit_si4713.mpy, and adafruit_bus_device files and folders copied over. You'll need to install the Adafruit_Blinka library that provides the CircuitPython support in Python. This may also require enabling I2C on your platform and verifying you are running Python 3. Since each platform is a little different, and Linux changes often, please visit the CircuitPython on Linux guide to get your computer ready! One interesting thing you can do with the Si4713 is measure the quality of an FM radio band. This is handy for example to 'scan' the entire range of FM frequencies looking for possible radio station broadcasts (i.e. frequencies with a good quality signal). This can help you find an unused frequency band to use for your transmitting. The higher the dBuV noise value the stronger the signal and better chance there's a real station broadcasting there. The exact values will differ based on your area and the nearby stations but in general a small value under 32 is probably unused, and a large value above 40 is a strong radio signal. Notice in the screen shot above 107.7mhz has a strong signal with noise value of 45 dBuV, this makes sense because a nearby FM station, Seattle's 107.7mhz FM The End, is broadcasting at that frequency. However at 107.35mhz the signal has a much smaller noise value of 29 and likely indicates an unused frequency. At this point the Si4713 should be transmitting anything sent to the audio jack or LIN & RIN inputs over the configured FM frequency. Plug in an audio source and try tuning an FM radio nearby to hear the signal! Remember the range of these low power FM transmitters is limited and you might need the radio in the very same room or close by to pick up the signal. Notice the input level is around -16 dB which is a typical value for audio (lower values mean less volume / input level and higher values up to 0 or more mean very loud input). The audio signal status is a byte that has a few bits to indicate status, in particular the 3rd bit will be turned on to indicate overmodulation (an easy way to check is if the value of the signal status is 4 or greater, that indicates bit 3 is on). You should aim to keep the input level around -20 to -10 dB and ensure the overmodulation bit isn't set (if it is then the volume is too high). Finally the RDS features of the Si4713 allow you to transmit data along with the FM audio signal. This is transferred in special side channels to the main FM broadcast and include data like the name of the station and the currently playing song. If you've ever seen a car radio that prints the name of a song being played it's probably reading it over an RDS transmission from the radio station. The station ID - This is a 16-bit value that the tuner can use to identify a station. In this case we're sending the value 0xADAF. The station name - This is an optional keyword argument that can specify a byte string with the station name to broadcast. You can only send up to 96 characters with this value. The buffer value - This is another optional keyword argument that can specify a byte string to broadcast as the current RDS buffer (typically shown as the song or now playing string on a radio). You're limited to 106 characters with this value. That's all there is to the basic Si4713 usage with CircuitPython! Below is a complete demo that will configure the board for FM transmission at a specified frequency (see the FREQUENCY_KHZ variable at the top). 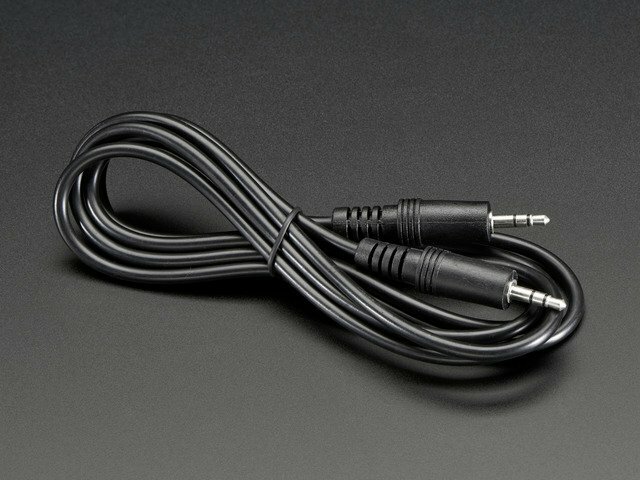 It will broadcast RDS data and periodically print audio input level and signal quality status. In addition it also shows basic usage of the GPIO outputs of the Si4713 with the gpio_control and gpio_set functions--these aren't commonly used but are available if you need a couple small outputs from the board. Save this as code.py on your board. # Simple demo of using the SI4743 RDS FM transmitter. # mentions you can only specify 50khz steps! # antenna capacitance setting, but see below to adjust to a specific value). # Alternatively measure with a specific frequency and antenna capacitance. # about this value, stick with the default automatic capacitance above! # capacitance (default, what you probably want). # Configure RDS broadcast with program ID 0xADAF (a 16-bit value you specify). # and buffer as byte strings so the character encoding is clear. # Set GPIO1 and GPIO2 to actively driven outputs. # Main loop will print input audio level and state and blink the GPIOs. # Print input audio level and state. # 'Blink' GPIO1 and GPIO2 alternatively on and off. Si47xx Programming guide - contains all the nitty-gritty details on command data packets etc. This guide was first published on Jun 26, 2014. It was last updated on Jun 26, 2014. Build an audio project that pumps 20 watts of power with the MAX9744 stereo amplifier.